How I Gained It: Growing up I was an active kid playing in the streets, not necessarily in sports of any kind. I ate what I wanted and was a medium-sized kid, not obese and not skinny. As I grew up, I was surrounded by many of Puerto Rico’s richest foods. A lot of times we ate rice, beans and pork. There was almost always some kind of vegetable, but I never ate it. I would load up on carbs and fatty meats. When I was in high school, kids started picking on me, and I wasn’t even that heavy. I think the most I weighed was 150 pounds. I decided to join drama, and made a group of friends that accepted me for who I was and all we wanted to do was act and have fun. I shed my baby weight during the last part of high school and became a “normal” size by just having that active social life and getting involved in a lot of school activities. I went off to college and didn’t gain the college 15 — right away. I actually went to the gym and had a great support system of friends that liked to do the same. Then all of a sudden it crept up on me. I would gain 15, then lose 10. Then gain 20, and lose 5. I had no idea what healthy eating was like, because I had never done it. If I noticed my pants were tighter then I’d cut back on some things and then go right back to eating bad once they fit again. At my heaviest back then in the summer of 2003, I asked my sister for help since she had shed weight from high school and kept it off for years. I joined her on the Atkins diet. I was eating the foods I was supposed to and working out sporadically and I lost 40 pounds. When I went back to school for my senior year, I slowly fell off the wagon and back to my old eating habits of bagel, egg and cheeses at 2 a.m., quesadillas, rice and beans and mini hot dogs whenever I wanted. I got out of college and continued eating whatever I wanted and only occasionally exercising, and eventually I gained all the Atkins weight back by 2007. I met my husband in 2007 and from there started a 35-pound weight gain over the course of three years. We were in love, going out to eat or ordering in all the time and just having fun. Breaking Point: There wasn’t a pivotal moment for me, there was a pivitol week. The week of Christmas 2010 I went to put on a sock and realized I had to bend my leg sideways just to put it on and by the time they were on I was out of breath! I couldn’t believe it, and vowed that my New Year’s resolution was to take the weight off. Later on in the week getting ready for Christmas dinner I put on a skirt that had fit just one month ago when I bought it and now it was too tight and I looked awful. I looked in the mirror and didn’t even recognize myself. That night I told myself I wouldnt wait until New Year’s Eve, I would start today. How I Lost It: The night of Christmas dinner, I noticed what I ate and how much. I didn’t even have dessert, not because I was punishing myself but because I was genuinely full. The next day I decided to use the Wii Fit to hold myself accountable, something I never did, even with Atkins. I hadn’t weighed myself since the summer when I was 197 pounds. I came in at 202. I was disgusted, but thought this time I will do it right. I went to multiple websites researching how people lost weight and what way would work best for me. Much of what I was reading was all about calorie counting. It’s fool-proof: calories in and calories out. So that’s what I did. I kept a journal and I went on websites that told me how many calories I would have to eat without exercising to lose one pound a week. I hated exercise, so I figured one thing at a time. In my first week of eating within my calorie limits, I lost six pounds. This really propelled me to want to continue. I eventually started incorporating walks into my day. At the time I worked in New York City, and I used the city as my gym. I would take the stairs anytime I could, I would walk up a hill if I saw one even if it was out of the way. I would walk 1.5 miles to work instead of taking the subway (saving me $100+!). I would also walk during my lunch. I also started getting into “The Biggest Loser” for motivation. I changed up what I did almost every month so I would never get bored. I started eating healthier foods, like lean protein. I would plan all my meals or even plan to eat at a restaurant by looking at menus beforehand. This didn’t always work — but that’s life, you just have to keep going. Eventually the time came that I had to work out harder to maintain, so I joined a gym. I switched jobs shortly after joining, but the switch just meant I had to adjust my plan. I even got engaged amongst all this. With each obstacle came that challenge which I craved because I knew I would never get bored. These days I want to excercise. I hated running and now I am going to do my first 5K in September! Now I can run four miles straight and feel amazing. I take walks with my husband after dinner. I don’t just want to sit there eating and drinking before I go to bed. I have a very active social life and I plan accordingly. All it takes is a little bit of effort once you’re in the groove. 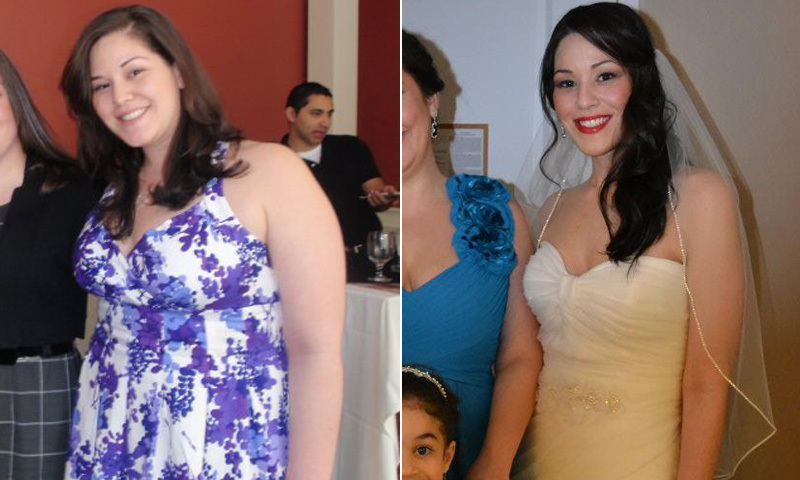 I can wear whatever I want, I can look back at my wedding pictures with pride and accomplishment, I can set and reach goals giving me more confidence at work. I just feel all-around amazing and when I get the chance to, I love to tell my story to try and inspire others. I just want people to feel the same way I did when I realized I got my life back. “I Weighed More Than Him.” Cyndy Lost 50 Pounds!